OverviewAbout the ActivityMudumalai is nestled amid ageless hills that line the southernmost edge of..
OverviewAbout the ActivityAmble through the royal lanes of Mysore and experience the grandeurs of a ..
OverviewRevisit the glory of Mysore, the city of palaces, and explore its golden history. 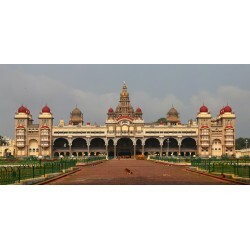 This 4 hou..
OverviewAbout the Destination:Mysore, a quintessential destination that brings out the essence of ro..
OverviewTake an enchanting walking tour in Mysore during Dasara when the city comes alive with pomp ..
OverviewThe best way to experience the glorious heritage of the kingdom of Tipu Sultan is to take a ..
OverviewRelive the delightful fictional era of the Malgudi Days as you step into this quaint part of..
Itinerary-Day 1 - Mysore ExplorationDevaraja Market, Traditional Lunch, Ambavilas Palace, Barbeque D..
OverviewAbout the ActivityEntice your taste buds with Mysore’s cuisine consisting of innumerable sna..
OverviewOn this absorbing tour, enjoy a visit to the silk weaving looms in Mysore and witness how th..
OverviewMysore has a glorious history which is reflected in the architectural wonders that dot the c..
OverviewAbout the Activity:Experience the magnificence of Bangalore in a 5 hour cycling tour, this g..
OverviewAbout the Destination:From Shravanabelagola and Melukote Tour, relive the rich history that ..
OverviewAbout the Destination:With Somnathpura and Talkad Tour, you will get whisked away to some sp..
OverviewWith this absorbing walk, discover the history of traditional board games and its evolution ..
Itinerary-Day 1 -Arrival and Check-in12 Noon Check-inLunch (Veg)Kabini Open Mini Bus SafariDinner (V..
Itinerary-Day 1 -Check in to the camp and have lunch. Please note the journey from bangalore is long..